Aren't holidays meant to be relaxing? To take some time for yourself and to make yourself feel good? At Le Port de Plaisance campsite, we understand this, that's why we invite you to our well-being area in Bénodet, at the very heart of your favourite outdoor holiday destination! "Terre & Mer" is the ideal place for those who want to take care of themselves during their stay in Finistère. This well-being area, on our campsite, welcomes you throughout the season and its beauticians can give you massages and other body and face care treatments. Contouring and other treatments are carried out by professionals in a relaxing and peaceful atmosphere. California massages, essential oil treatments, beauty treatments for face, hands and feet, etc. choose whatever you prefer and finally grant yourself the well-being treatment you deserve! “Terre & Mer", the campsite’s spa and well-being area, also has a steam room, sauna and herbal tea room where you can relax with a hot drink in a harmonious and relaxing setting. California massage, slimming, energizing, treatment for tired legs, foot reflexology, radiance treatment, manicure, foot beauty, hair removal, etc. Whatever your desires and needs, the "Terre & Mer" spa team will be able to meet them. Visit the spa reception desk to discover a menu of the treatments offered or download it directly by clicking here. You can book an appointment directly on site or request information by contacting the spa reception desk on 02 98 57 25 25 44. Access to the steam room & sauna is free for one hour with any reservation of a body and / or face treatment (except for young children). 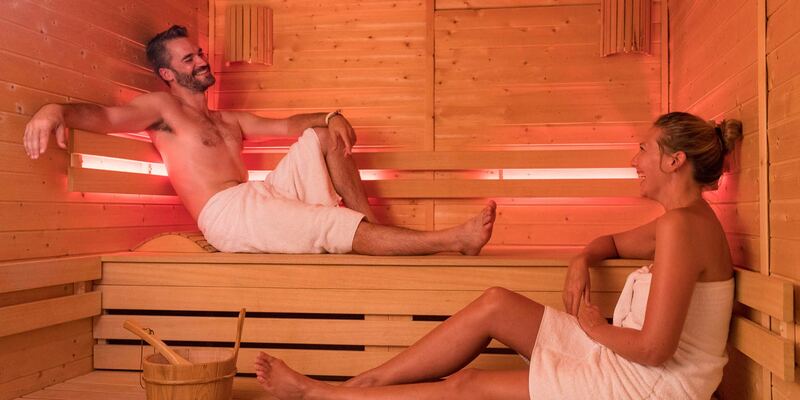 Without a treatment, access to the relaxation area is €5 per person.